An enjoyable and above average Spaghetti Western starring Henry Silva, with an Ennio Morricone score. Optimum UK R2 DVD. 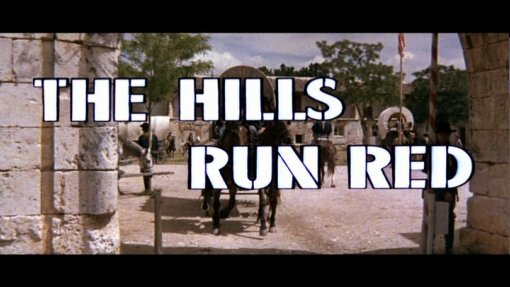 Made during the boom year for the genre, The Hills Run Red was scripted by Piero Regnoli (who had previously worked on Sergio Corbucci's Navajo Joe (1966)) and is really none too original, featuring a basic revenge storyline that would crop up a hundred times down the years. Fortunately Regnoli focuses his energy on giving the plot a good backing with some effective characterisation and a generally strong script throughout. One interesting aspect that does differentiate the film is that the character of Ken has quite a minor role compared to Mendez the chief farm hand, who quite realistically seems to run the show at the ranch. The tone throughout is generally quite dark although there are a few light hearted moments, that stop it becoming too grim. Pacing is very good and thanks to the effective characterisation, the climax is genuinely tense and gripping. Director Carlo Lizzani (credited as Lee W. Beaver) does good work here, mixing solid camerawork throughout most of the film with some neat touches including a Corbucci-esque close-up fistfight. The direction, like the script, keeps the emphasis on the realistic and so the fight scenes leave the characters plausibly bloody and they carry the scars the rest of the film. Ennio Morricone (credited as Leo Nichols) gives the film an effective soundtrack with a typically distinctive opening song - although the main theme does seem to crop up a little too often. American lead actor Thomas Hunter had just made his film debut, in another Italo-Western, when he starred here. Fortunately this lack of experience doesn't stop him turning in a strong and very convincing performance and he works well with fellow countryman and Western veteran Dan Duryea as his partner and the Italian actor Nando Gazzolo as his rival. The scene stealer however is yet another American actor, Henry Silva (a familar face in the later Italian crime film boom) - looking genuinely Mexican he is able to balance the character's humanity and anger very well and even his maniacal laugh isn't hammed up, an outstanding performance and it is a pity that this was his only Spaghetti Western. The script's lack of originality sadly stops The Hills Run Red from being classified in the genre's upper echelons but it is undoubtedly one of the best midcard entries thanks to a fine script, impressive production and an outstanding performance from Henry Silva. It comes recommended to Spaghetti Western fans who want to explore the genre's lesser known entries. Directed by anyone	interesting? Carlo Lizzani (as Lee W. Beaver) - best known for directing Rod Steiger in The Last Days of Mussolini (1977) he also helmed the Spaghetti Western Requiescant (1967) and a large number of minor Italian films. Anyone else involved? Ennio Morricone provides a solid soundtrack although like most of his early films, under a pseudonym. Any gore or violence ? A number of deaths and some light blood. Who is it for? A solid Spaghetti Western midcard entry that genre fans should certainly track down. Audio English mono - sounds fine although the dubbing is not perfect - a few lines and effects seem to be missing (almost certainly a fault on the original audio track). Other regions? Available in the US from MGM on DVD and Bl-ray. Available from Koch Media Germany on DVD as Eine Flut von Dollars with interview features. Cuts? Cut status unknown - Italian version may run slightly longer. Print language is English. Hardly the most original storyline but the script is otherwise sound and the film is well directed. Recommended to genre fans. A solid looking and sounding print although without the bonus features of the German disc. All text in this review written by Timothy Young - 15th August 2008.